During this Summer one of my many customers was Ubiquitous Risk Solutions based on the Surrey/Berkshire/Hampshire borders. Frequently though their clients are worldwide as they provide a range of services including Personal Security, Residential Security, Bodyguards, and Counter Terrorism Briefing. They also provide training in these areas too. As part of their Summer Marketing campaign, they sent marketing letters with chocolate bars inside as a means of acquiring new customers. 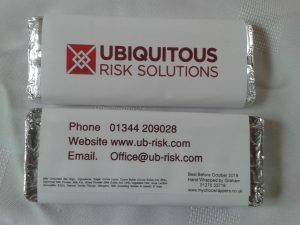 All the prospects mentioned the chocolate bars during the follow-up process – so the bars definitely got Ubiquitous Risk Solutions remembered !